I have found documented proof dated April 2015 that 2,500 imperforate forgery sets and 500 progressive color proof sets (including final imperforates) have been moved onto the market! As I predicted last year perforated stamp forgeries of this issue are now on the market. 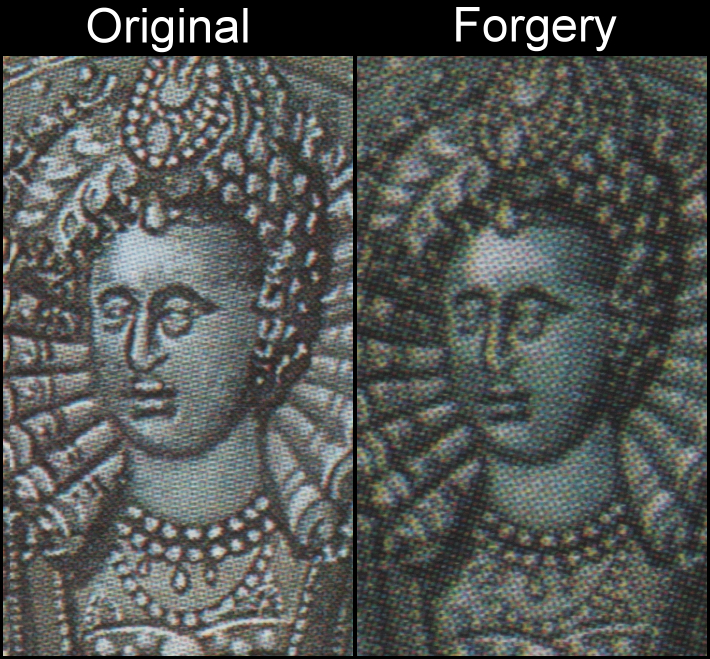 I just purchased a set of perforated forgeries and added the image above. Everything is the same as the color proofs I describe on this page. White gum, cheap white paper, inferior screens causing blurry images. Even shoddy centering as you can see. These I purchased on eBay from a seller in Canada who had no idea that they are forgeries. This discovery is a little different than the many others I wrote about. 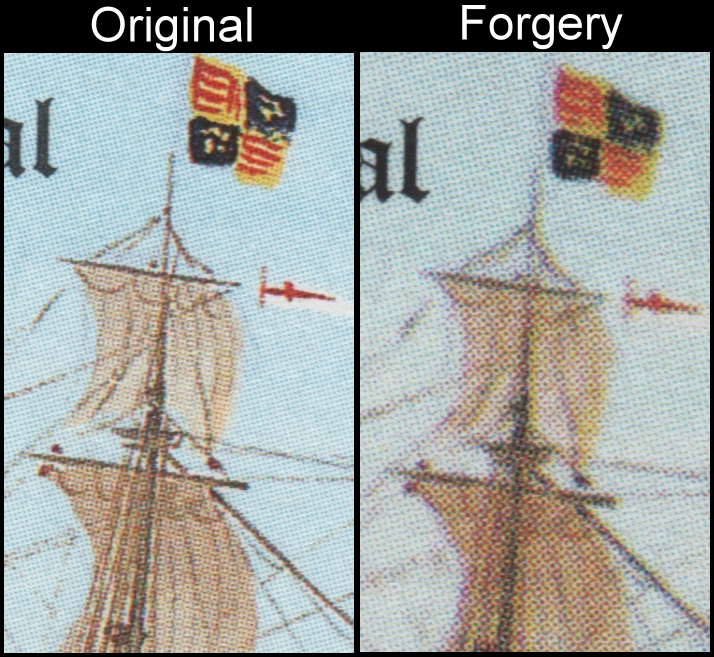 The "color proofs" show us just how far these forgers will go. 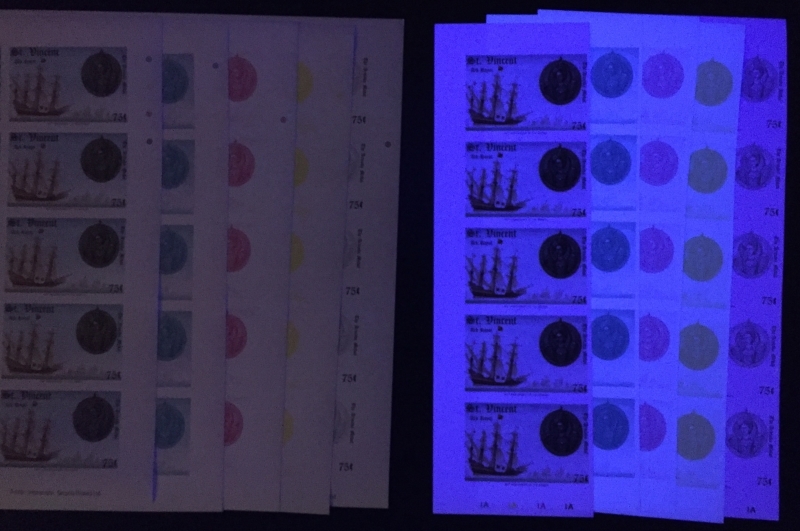 Not only creating forgeries of the normal issues as imperforates or inverts but now even as progressive color proofs! I have discovered that modern fake stamps of this issue have and are being flooded onto the market. I can tell you that real dangerous	fakes or some call forgeries are being flooded on the market as I write this page in July of 2016. My research into the printer has enabled me to discover modern fake stamps have been created in 2014!! They are being spread across the world through online auction sites like ebay and Delcampe. Everything about them is fake except for one dangerous fact, they have the correct perf size. The gum type is different in it being white in color and very shiny. This gum type was not used until much later years, long after Format went bankrupt thus proving they were not produced by the Format International Security Printers. Obvious differences will be shown below. 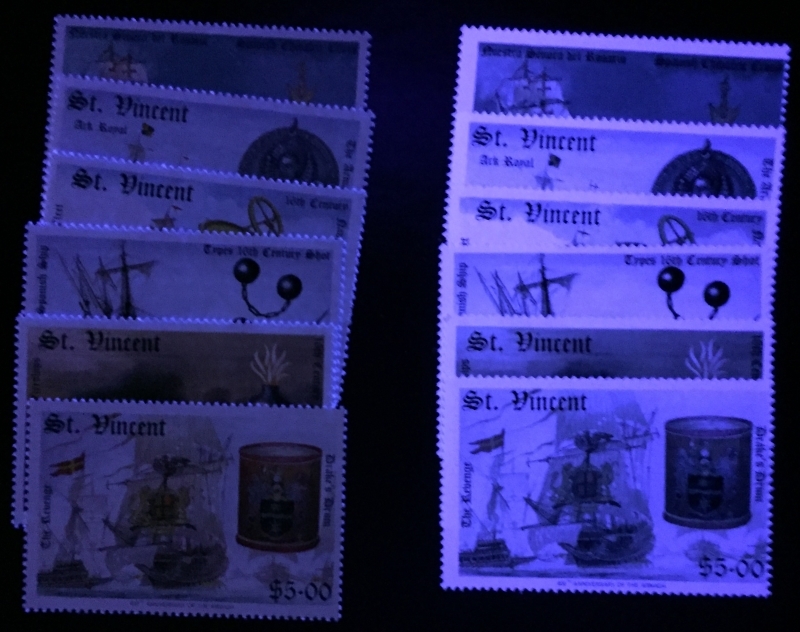 So far I have discovered complete sets of forgeries of the Saint Vincent 1988 Spanish Armada issues as imperforate progressive color proof sets.The normal issues have also been forged. Also the souvenir sheet which has never been offered as an imperforate until the forgeries appeared. All are being offered online right now as I write this on July 29, 2016. As of September 2017 I have once again updated sections of this page and added the ultra-violet detection section. 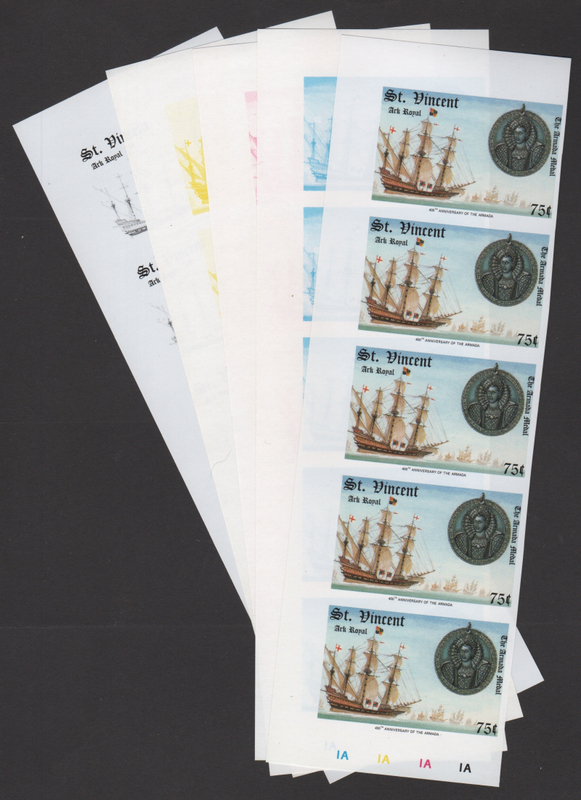 Addition of the fake imperforate souvenir sheet has also been added. 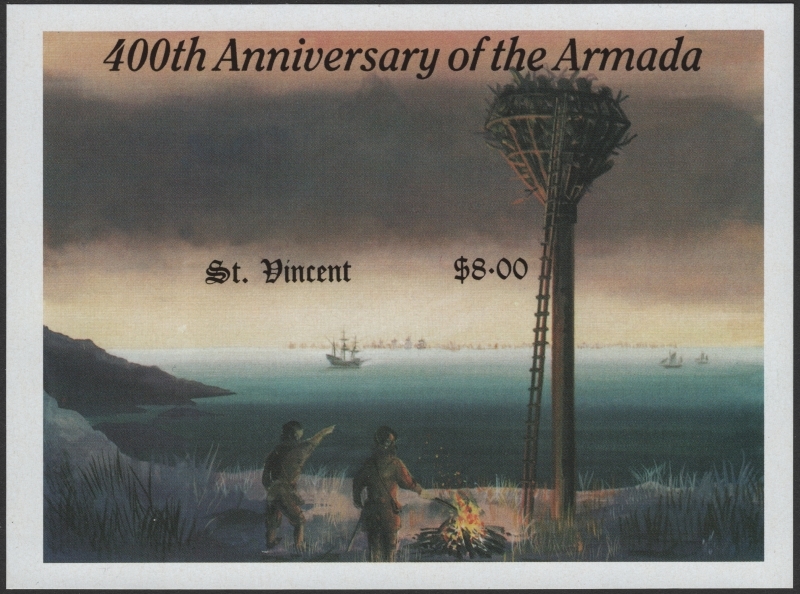 I noticed sales of the Saint Vincent Spanish Armada issues as color proofs being sold on ebay by Latvian seller armi777 months ago. I knew there was something wrong because there were only 5 stages of the colors whereas originals have 7 stages. You see back in 2012 user city-collectables on eBay sold off all the original panes of the progressive color proofs that were originally confiscated by the British Police in 1989 and held until 2008 in their warehouse. The complete stock was purchased by city-collectables in auction and sold to the public on eBay. I was lucky to get a complete set of the panes of all the values at the time. I knew that they are forgeries because of the many other forgeries I have purchased from these dealers already. I purchased a couple sets (values) around 4 months ago. Before that I was always outbid when they came up. I was outbid on several values that time too but managed to get two sets like the one imaged above. I was waiting for this seller to post more to try to get the other sets but to this day they have not posted them again. Sure enough, when I received them I could see they are exactly the same as all the other forgeries I have written about. I got them for around $3.00 each set like the one imaged showing how easily they have now been filtered onto the market. This dealer is and has persisted in selling many other forgeries and is not to be trusted. The first and most obvious way to tell is the number of color proofs. If there are only five....something is wrong! 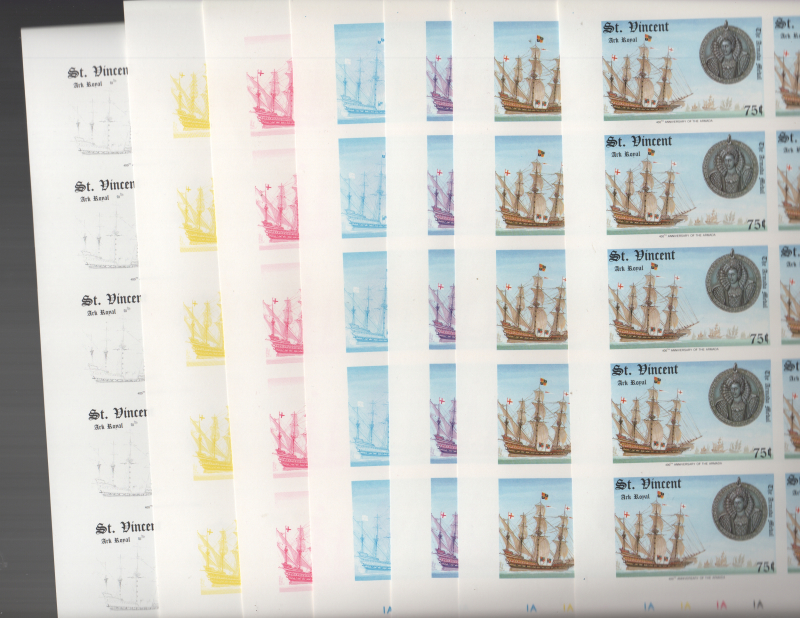 All progressive color proof sets made by the Format Printers during 1988 had seven or more color proofs in the set. Here is an image of what a real set looks like! 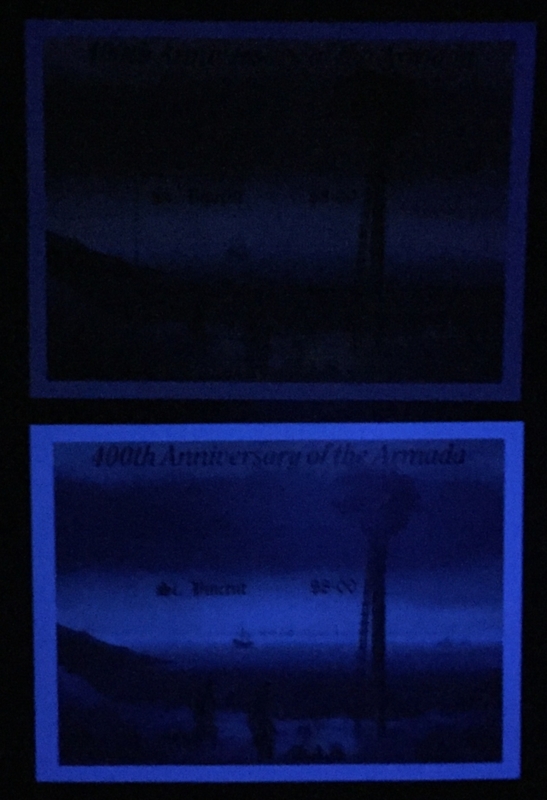 For the normal perforated version of this issue that I have acquired the forgeries glow brightly as this image shows. The same holds true with the imperforate color proof forgeries. Here is a comparison with the genuine color proofs from the City Collectibles sales. 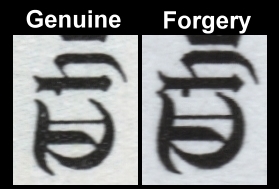 I left out two of the proofs to match the forgery set. The same is also holding true for the souvenir sheet forgeries. Here is a comparison with a genuine perforated souvenir sheet. Let us use the 75c Ark Royal stamps for high resolution comparisons. I use 1200dpi scans for viewing. This first comparison shows you how inferior the screens are. 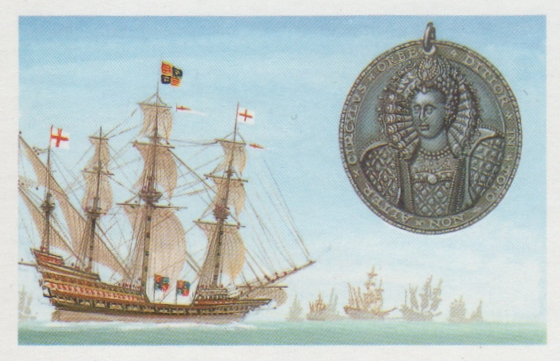 I first compare the Armada Medallion. You can see that the screens used on the forgery are coarser. Much of the details are lost on the forgery. Note the difference in color. The forgeries still are very dangerous because when imaged for sale by sellers they look almost exactly the same as the originals. Buyers will think it is just the sellers scanner making them look "different". To compensate the forger uses a shinier surface on the face of the stamps. Now here is a look at the center mast and flag. Here you can see a big difference in the color and see the difference in the screens used. Now let's look at the blue proof. 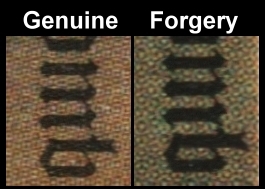 You can see that the screens on the forgery stamp are completely different. Now I will show reduced images of the original perforated stamps with the newly acquired perforated forgeries. Sky and water are shades of blue on genuine stamps. It is shades of green-blue on the forgeries. All the "accent" marks are larger and more pronounced on the forgeries. The sails are much darker as is everything on the forgeries. The "C" and the "h" in the word "Chibalric" are very close on forgeries whereas they are well spaced apart on genuine stamps. The sky is shades of very light blue on genuine stamps versus greenish-blue on the forgeries. The medallion is lighter on the genuine stamps and does not have the yellowish hue that the forgeries have. All the differences I show above in the high definition images. 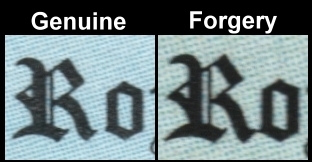 The "R" and the "o" in the word "Royal" touch on forgeries whereas they are well spaced apart on genuine stamps. The sky is shades of light blue on genuine stamps versus greenish-blue on the forgeries. The ocean is shades of yellow-green on the genuine stamps versus green on the forgeries. The navigational sexton is bright gold on genuine stamps. It is duller and darker gold on the forgeries. 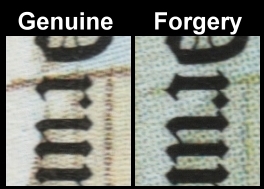 The "T" and the "h" in the word "The" touch on forgeries whereas they are well spaced apart on genuine stamps. This forgery is interesting because it has a sure giveaway. 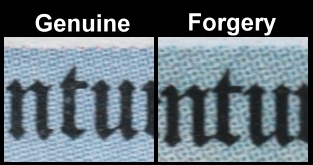 Under high magnification you can see that on genuine stamps the fonts for "St. Vincent" are opague. Here is a comparison. You can see the ship and boats through the letters. It is the same on all the values but this stamp shows the opacity easier. The forgeries all have solid lettering and you can see nothing through them. Everything is darker colors on the forgeries. The sky is light blue on genuine stamps versus almost shades of white on the forgeries. The "n" and the "t" in the word "Century" touch on forgeries whereas they are well spaced apart on genuine stamps. You can see the greenish tint on the fakes versus the light brown tints on the originals. The smoke is shades of brown on genuine stamps. It is almost black on the forgeries. The "m" and the "b" in the word "Firebomb" almost touch on forgeries whereas they are well spaced apart on genuine stamps. You can see that the forgery has a heavy greenish tint throughout the stamp. The drum has bright red rims and is shades of orange and burnt orange on genuine stamps. The drum on the forgeries is dull, has very dull red rims and is shades of dull gold. 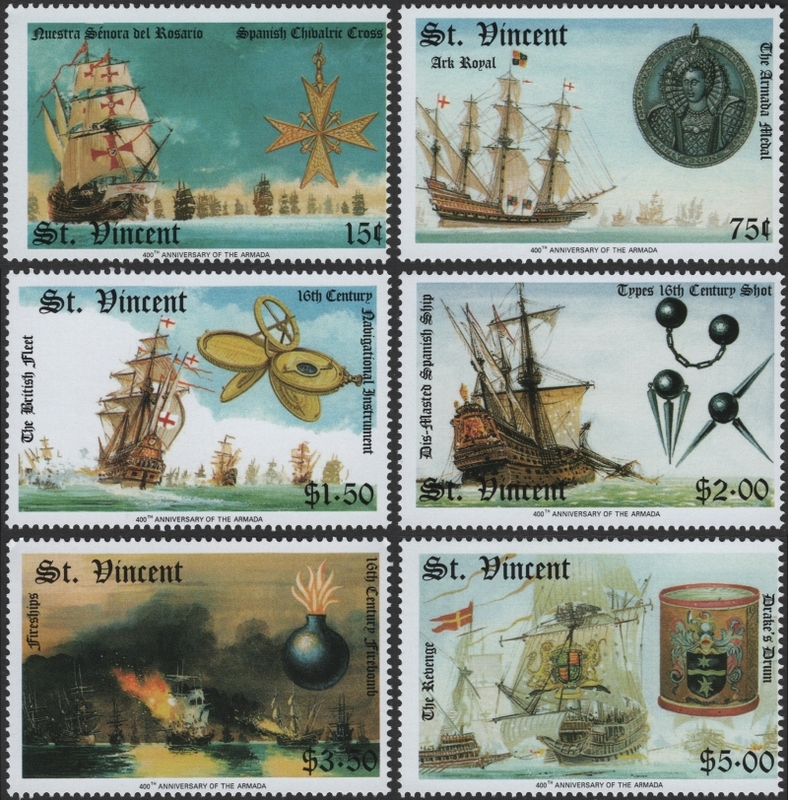 The color of the top two sail banners under the "St. Vincent" are brown on genuine stamps and the lower one is gold. On the forgeries all three are gold. The "r" and the "u" in the word "Drum" almost touch on forgeries whereas they are well spaced apart on genuine stamps. 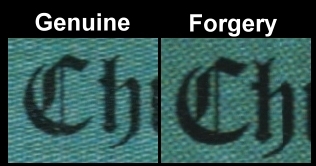 Note the larger "wing" on the "r" on the forgery as well. As I noted earlier there are two proofs missing in the fake set. The all colors proof with no inscriptions and the blue-red proof. Here are images of originals. Now let's look at the blue proofs side by side. 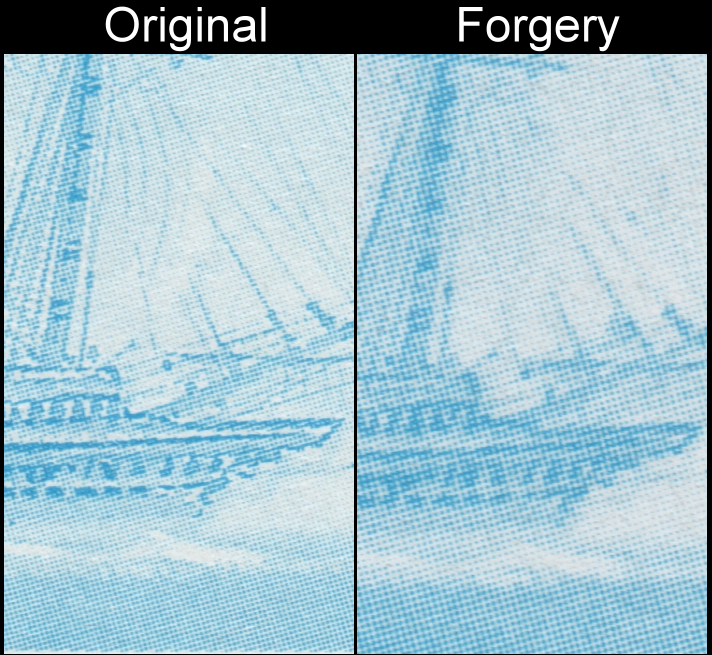 You can see that the blue is darker on the forgery stamp. Now let's look at the red proofs side by side. Note the clarity on the original stamp. The reddish color in the background on the forgery. Now the yellow proofs side by side. Again noting the clarity on the original stamp. This time the yellow color in the background of the forgery. Now the black proofs side by side. Quite a difference! Note the very white paper on the forgery. Unlike the gum on many of the forgeries that are flooding the market right now the gum on the imperforate souvenir sheet forgery is more yellowish in color. It is opague though in comparison with the original gum. This type of gum has appeared on quite a few other issues I have detected as forgeries like the St. Vincent Century of Motoring issue and now many Locomotives sets. It is having a tendancy to curl worse than original gum. I do not know if these were produced earlier by the forger and	held until now, but they did not appear here on the market until recently. Everything else about the forgeries is the same as all the other forgeries I have described as you will see. This yellowish gum does make them harder to detect though at first glance without originals to compare with. I note the opacity of the forgery. You can see the face image through it quite easily whereas on genuine souvenir sheets the gum is much less transluscent. This first comparison shows you how inferior the screens are. 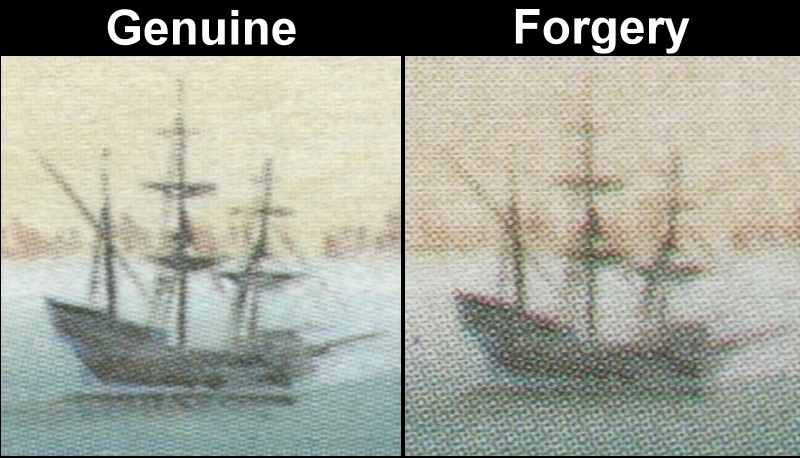 I first compare the ship in the water. You can see again that the screens used on the forgery are coarser. Much of the details are lost on the forgery. Note the difference in color. 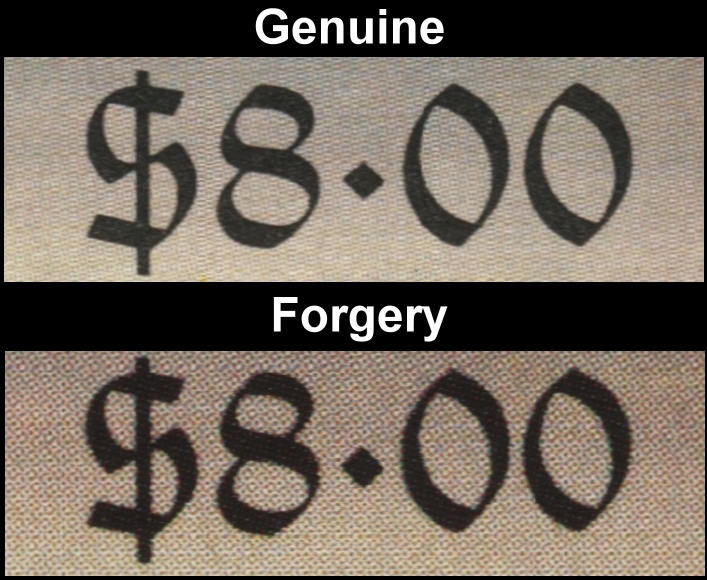 You can see that the fonts on the forgery are darker and blurry. The fonts on genuine souvenir sheets are clear and crisp. Now I will show reduced images of the genuine souvenir sheet with the imperforate souvenir sheet forgery. You can see this is a difficult one to determine by images given by sellers on auction sites and elsewhere. They were never produced and sold by the printer and did not appear on the market until 2015. Noting that the forgery is darker than the genuine issue in all ways. Noting the water is shades of blue on genuine souvenir sheets versus shades of green on the forgeries. The plastic wrapping is a flexible plastic used today. 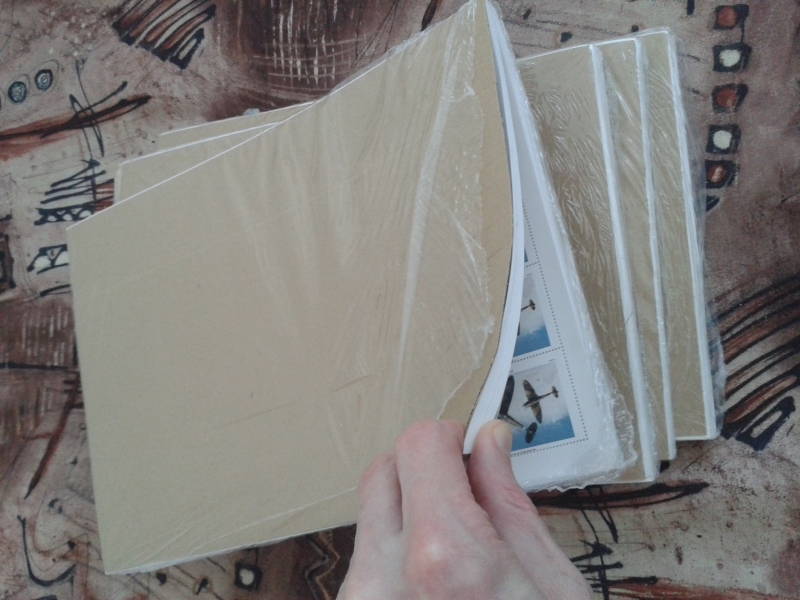 Format packaged all stamp panes in very brittle hard plastic that tears easily when opened. The separation paper is brown. Format always used pink/red paper to separate and protect the panes and souvenir sheets. If panes are packaged like this it is a sign to beware! 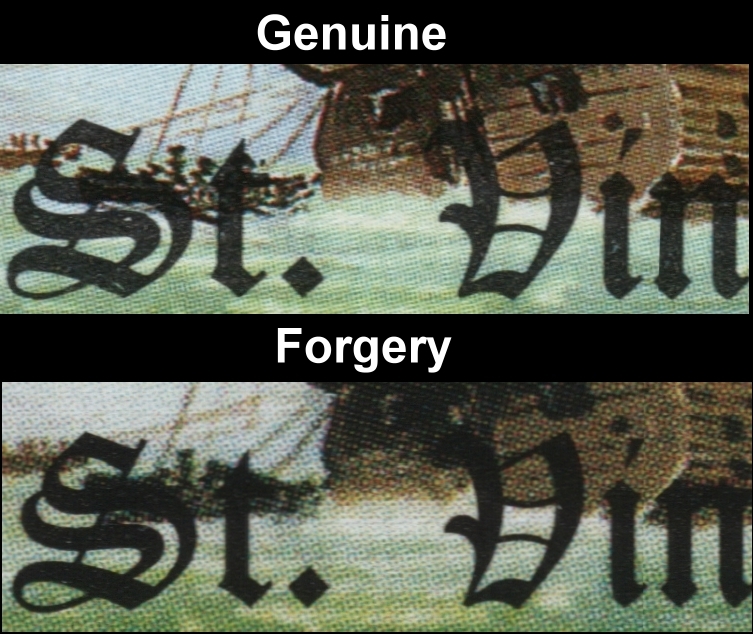 You can now define the fake Saint Vincent 1988 Spanish Armada stamps, color proofs and souvenir sheets easily and can now possibly avoid being ripped off! Sorry to say this, a lot of you already have been fooled and more of you will be until the right people get serious about it and stop these clowns!